The Church of St. Simon & St. Jude (Kostel sv. Šimona a Judy) is situated in a peaceful corner of the Jewish Quarter near the Vltava River, just a few minutes walk from the Old Town Square. The origins of the church date back to 1354, when a hospital was founded on the site. This had a chapel attached to it, which was sanctified by bishop Arnost from Pardubice, a close friend of the Emperor Charles IV. In 1615-20 the chapel was significantly enlarged to a hall construction with galleries and chapels, and windows in the Late Gothic style were added. The new church, a mixture of Gothic and Renaissance styles, was consecrated on 14 July 1620. Shortly afterwards Emperor Ferdinand II gave it to the Order of the Merciful Brethren of John of God (who own it today). Around 100 years later St. Simon & St. Jude was remodelled in the Baroque style and a pipe organ was installed. Its unique sound has drawn famous composers such as W.A. Mozart and J. Haydn to play at the church. In 1989-93, with the fall of communism, the city of Prague initiated a major restoration of the church, including the installation of under floor heating to allow for comfortable services all year round. 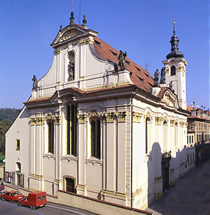 The maintenance of St. Simon & St. Jude was recently handed to the Prague Symphony Orchestra, who use the church for a series of chamber music concerts. Concerts are held just a few times each month, throughout the year. In such a beautiful setting (the church is also used for audio and video recording, and radio and TV broadcasts), and with musicians from such a prestigious orchestra playing, we can highly recommend the concerts. During the winter the interior of St. Simon & St. Jude is heated, but it is advisable to wear warm clothing for the concerts.